When I was at school in the final 10th class, a missionary teacher from far off New Zealand had arrived in Punjab in the hot summer of 1958 to teach in a school located at less than 100 km from my school - wish I had known him then! The Destiny, surely, keeps its own mysterious calendar and scheme of events to happen! It was on 22nd January, 2002 that I received a phone call in Yerevan, capital of Armenia, where I had spent more than two years as the first resident Ambassador of India. The call was from Director in the office of Foreign Secretary, Mrs Chokila Iyer. He conveyed to me, in an excited tone, that 'she has been successful in getting me posted as High Commissioner to New Zealand' and that I should 'coordinate with Wellington to reach there as early as possible'. I was, in fact, getting reconciled to brave extra period in Armenia. I had, of course, represented to the Foreign Secretary putting on record that I had been given to understand by the Ministry that my posting in ' that tightly-locked-mythological-land of Noah's Ark ' would be for two years. The news was indeed most welcome and a hugely pleasant surprise. It was not that I was feeling miserable in the legendary land of Koh-e-Kaaf but it was the tyranny of Time for me: the date of retirement had started staring me in the face! The three names I should be privileged to meet in New Zealand flashed in my mind - the Everest hero Sir Edmund Hillary; the architect of new India-New Zealand relations, former Prime Minister David Lange and a relatively lesser known to me, Professor William Hewat McLeod, the once-upon-a-time teacher in Kharar - now a prized suburb of Chandigarh - who had earned international reputation as as a historian of the Sikhism, the religion of my people of Punjab. I may, however, admit that I have always felt quite confused whenever I have to fill the column of 'religion' in any form. Though never a strict practitioner of any rituals, I have always felt deeply solaced with the 'spirit' of the Gurubani of Sikhism and have also been drawing an inner comfort and wisdom from broader cosmic tenets of the heritage of Hinduism as per tradition in my family of free thinking scholars with saintly pretensions. It was on 18th August 2002 that my wife, Aradhana and I were destined to enjoy the distinctly serene company Prof W H McLeod & Mrs Margaret Mcleod, in an Indian restaurant in Dunedin, one of the farthest towns on planet from Kharar/Delhi (12,474 km)! Dunedin, capital of New Zealand's southern province of Otago, was founded by Free Church of Scotland in 1848 and given the old name of Scottish capital, is regarded the most Scottish city outside Scotland. It is an important centre of education, being the site of famous Otago University. We had gone there to participate in the cultural evening organised jointly by all the students from South Asia - Indians and Pakistanis in the forefront - to celebrate the Independence Day of India. Mrs Sukhi (Sukhinder Kaur Gill) Turner, the popular record-third-term Mayor of Dunedin and wife of great Kiwi cricketer Glenn Turner, was our gracious host for our 'City & Sea Darshan (Sight Seeing)'. McLeods impressed us as 'the made for each other' couple and gentle persons who had genuinely fallen in love with the Punjabis and their dynamic faith. They appeared eager to know more and more about Sikhism and culture of Punjab. Incidentallly, while talking about the social divides among the Sikhs, I mentioned that I had recently read that Professor Puran Singh was an Ahluwalia and that his community had arranged for his going to Japan for higher studies. I noticed that Professor McLeod had immediately noted it down! As an avid collector of books autographed by their authors, I was privileged to receive from Hew copies of, 'Punjabis in New Zealand - A History of Punjabi Migration,1890-1940, GND University, 1986 '; 'Guru Nanak And the Sikh Religion, Clarendon Press, Second imp. 1978' and 'The Evolution of the Sikh Community - Five Essays, OUP, Second Edition,1995 '. 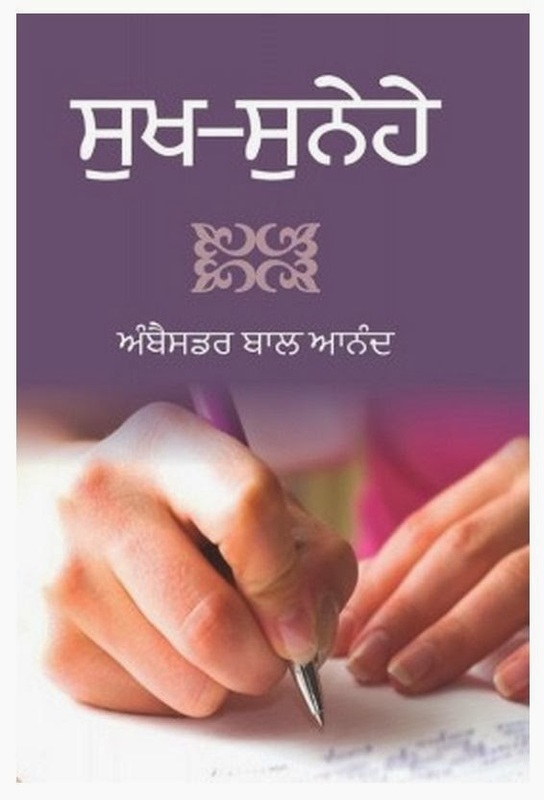 The first book contains, a hardly ever known, touching case study of Dr Baldev Singh, a highly qualified medical practitioner and son of eminent Sikh scholar Giani Ditt Singh. Dr Baldev Singh was imprisoned for several years and deported in 1931 under a false case cooked up by the racist local rivals. Thus began a mutually fruitful and long lasting dialogue between Hew and I. The first one was an almost possessed and indefatigably painstaking scholar scouting all over for impeccable sources of references on Sikh religion; an ever willing listener and keen to cross check with any one interested in the subject. And the other one, myself, is committed to remain completely unencumbered with a burden of any one faith but feeling perfectly at ease with all the faiths of mankind; ever ready to borrow wings of ecstacy offered by the Vedic hymns; Sufi's songs; Bhajans of the Bhakatas; chants in a Buddhist Monastery or a Church of any Christian denomination; serene Silence of Baha'i Lotus Temple and, of course, the rarified musical harmony emanating from the precincts of the Gurdwaras of the faith founded by the Sikh Gurus, sung in the supposed tongue of my mother who had been summoned by Akal Purukh - ' the One Beyond Time ' - before I could learn to utter any syllable! Also we feel the necessity of a (new) Messenger! I had a great satisfaction that I could arrange, during this visit, McLeod's meeting with Mr Navtej Sarna, an erudite Indian Foreign Service colleague and most promising author who was then spokesperson of Ministry of External Affairs (Presently India's Ambassador to Israel). I do hope that this encounter of two different generations of highly scholarly minds must have been a deeply mutually rewarding experience. I hope Navtej would one day be be able to steal time to write about McLeod as a Historian of Sikhism. My innings in New Zealand was of limited 20-overs kind, cut shorter by the 'rain' of calendar. 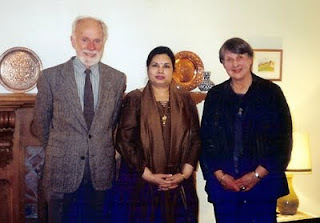 I could meet the McLeods for the last time on 29th June, 2003 when I visited Dunedin to participate in a Seminar called, '38th University of Otago Foreign Policy School, The Ethics of Foreign Policy'. Hew & Margaret invited me for an evening meal at their lovely home located next to the Dunedin Gardens, with a stream flowing by. I was pleasantly surprised to be served with the typically homely Indian preparations. During my tenure as High Commissioner in New Zealand, I had launched - the first ever and also to be the last till date - a publication of the High Commission titled, 'Megh Raajdootam i.e. The Cloud Envoy'. McLeod graciously accepted my request for contribution of an article which I was glad to publish in the August 2003 issue of Megh Raajdootam under the title, ' Punjab - Discovering Faith in History ' dwelling on their stay in Kharar and Batala between 1968 - 1969, later to be a part in his forthcoming book, ' Discovering the Sikhs - Autobiography of a Historian '. I took the liberty of editing half a sentence of this article! After retirement from Indian Foreign Service in December 2003 which involved a consecutive stay abroad for the last more than 21 years, it took some time for us to settle down in Delhi to do what I had told my old friends, 'All is in the hand of the Hidden Hand ... but I would try to do in the remaining silver years of life what I had always wanted to do i.e. the three R's - reading, reflecting and hopefully writing too!'. The contact with Hew was renewed in the context of an interview by him titled, 'Demanding Work Seeking the Sikhs' carried by Otago Daily Times, Weekend, February 26-27, 2005, sent to me by a mutual friend, Dunedin based young Indian lecturer of Management Studies, Mr Anupam Shailaj. The interviewer had observed that, "However careful they are, when historians attempt to separate historical certainty from enveloping religious traditions they find themselves embroiled in a hornet's nest". McLeod had spoken about 'a life time of research and analysis into the history of the Sikhs and the controversy it sparked', adding, "I insist on the necessity of finding sources that are reliable ... Sikh have been brought up on tradition ... tradition is not historical ... it is upsetting to believers, but what does one do? ... What I have done and what I am saying, it is in print not personal..". Referring to McLeod's 16 books and numerous articles, and editing and translation of many works on Sikhism, it was stated in the interview that 'the campaign to discredit his work - led by a small group of Sikhs, escalated after 1984 ... this campaign of abuse now appears to have mostly died down ... '. Honestly, I had not been exactly aware of the nature and the Sikh diasporic dimensions of any controversial elements attributed to McLeod's writings - and that his work has been raised to the level of 'McLeodian', an adjective, used by one of his critics! I had noticed Hew's frail physical appearance, but his robust intellect and alertness of the mind did not reveal any sign of a failing health. It was in a message of 19th March, 2006 that Hew wrote about his being diagnosed with multiple myeloma ' which is incurable bone morrow cancer '. He had added, " the fact that it is incurable does not mean, however, that I have to bid good bye to this life immediately. ... and in the last two three years the treatment has taken large strides ... I am now on regular thalidomide and I feel absolutely normal. My aim is to last at least 15 more years which will make me 88!" Hew & Margaret, in a communication to friends on the eve of Christmas of 2006, further revealed, "There's nothing much to tell you this year. Margaret is fine and in Hew's case, the cancer appears to be under control ... We lead a quiet and regulated life, walking down to our favorite cafe for coffee every afternoon ... and that is how things are for us. It's not a bad life, really quite good in fact." I continued to exchange occasional messages with Hew on matters relating to Panth ( Sikh Community ) and other notable developments in Punjab. When I did not receive any response from him to my messages of news reports on the recent tragic violence in a Ravidas Temple in Vienna and its reaction in Punjab, I thought he might have been busier with the family or lazier during strong southern winter. Then came the message from Margaret & family on 21st July that, ' Hew passed away peacefully last night .' The funeral took place on 24th July at Ross Chapel at Knox College where Hew had set out on his epic journey in search of a meaningful research in the world of History ... destined to make history of a vibrant and uniquely distinct microscopic minority - the Sikhs of Punjab - the work of his life time. Rest in peace, O child of history, amen!